This is superb reference to the Jagdpanther. As always the Panzer Tracts team has used its years of research to give us information that is drawn only from German archives or examination of surviving vehicles, with none of the mistakes of Allied Intelligence reports repeated here. There were two types of Jagdpanther, the Ausfuehrungs G1 and G2, with the G2 having a longer engine deck on the same length of hull and therefore a steeper angle to its rear superstructure. This demonstrates that the notorious kits with different rear superstructure angles may both be correct ,depending on which engine deck is provided. The book gives very complete development and production histories, with data on month-by-month production. Modifications during production are described, as well as those authorised to be made by user units. The stowage bin on the rear of the superstructure turns out to be a unit addition by sPzJagAbt 654, not a feature of early production Jagdpanthers as some have stated. A detailed chapter on organisation and tactics ends the book, alike the rest of the text it includes extracts from unit reports to provide an insight into actual tactics and into what changes the crews wanted in both equipment and tactics. A plethora of period photographs show exterior differences and interior details, with no photos of possibly inaccurate museum restorations. There are four 1/35 scale five-view plans of the major production types and 1/35 plans of the belly layouts of Ausfs G1 and G2, and 1/10 scale drawings show all the important parts and fittings in even more detail. 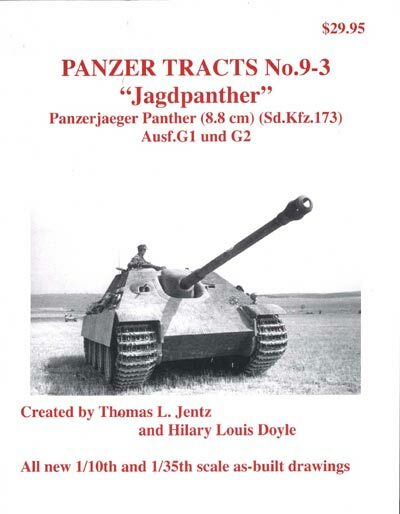 No Jagdpanther modeller should build without this book - very highly recommended!